Craft foam has been one of those items I’ve stored in my craft cupboard for a long time because I’d planned to make something cool with it but have never gotten around to it. Recently we decided it was time to pull it out and get crafting because I hate seeing good materials just taking up space and going to waste. I set out an activity which I thought would be fun and whilst I was explaining what we would be doing Miss K started cutting the foam up into a million tiny pieces with her scissors. This was not what I’d had planned at all! But kids have a creative mind all of their own and the change of direction turned out to be a change for the better. 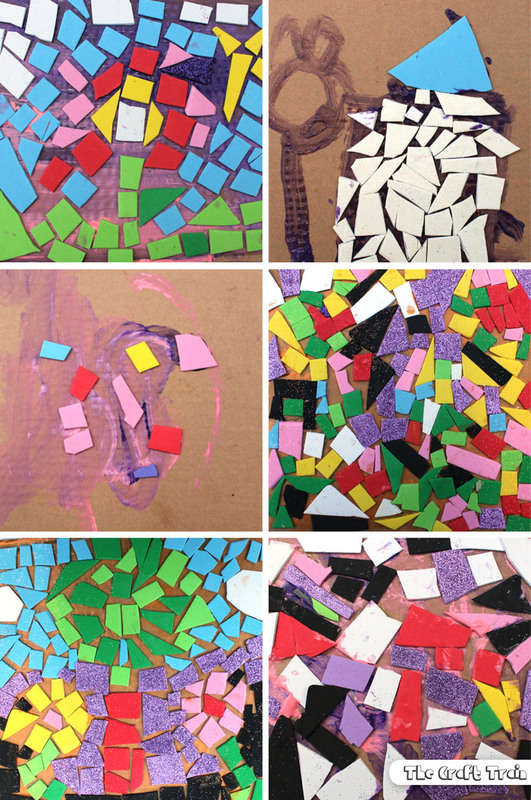 Miss K had great fun cutting up the foam and then we decided to work the pieces back into a completely different project – a mosaic. I have to say it’s a great art activity for kids of all ages. 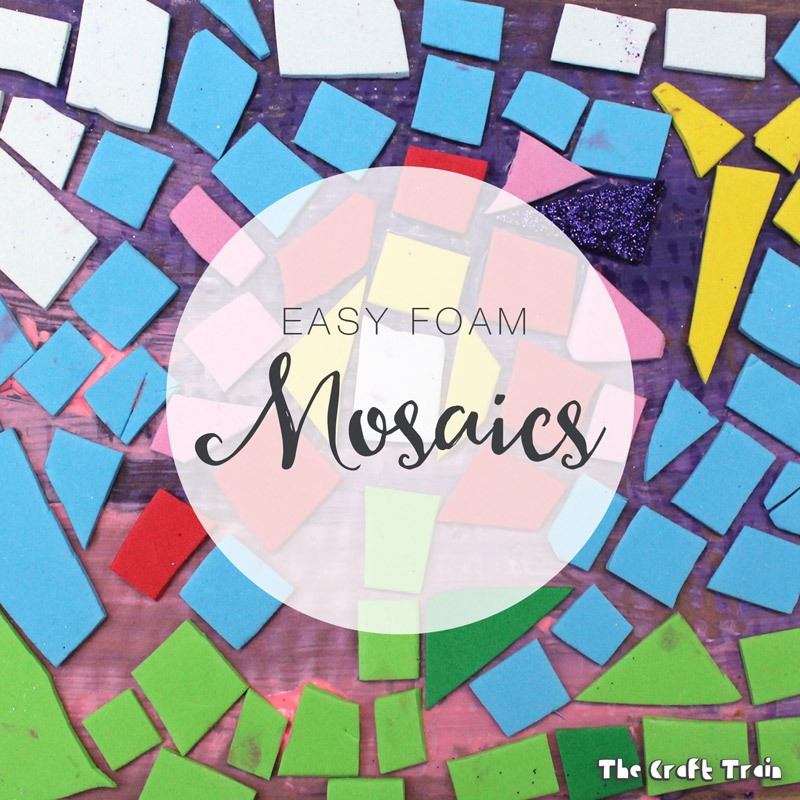 Little kids can stick the foam pieces on in an abstract pattern while big kids can make pictures with the different coloured fragments. It’s also a good way to use up any scraps of foam that you might have left over from other projects so don’t throw them away! • Coloured craft foam. We also used some sparkly glitter foam. Cut up your cardboard box or other heavy board into small squares, ours are about 18cm square. Cut the foam into tiny pieces. It’s good to have all different shapes to patch together like a puzzle. The kids really loved cutting it up, it’s soft and easy for little hands to do. 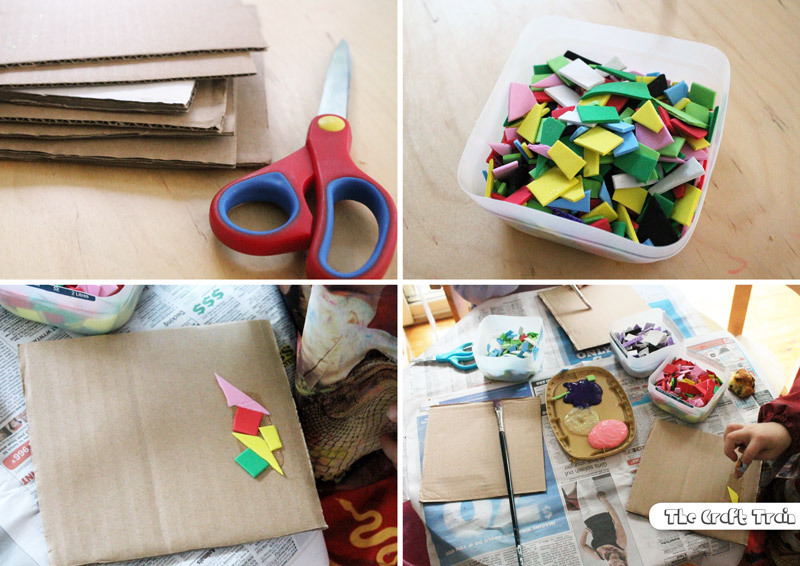 Glue the foam onto your cardboard to create a gorgeous artwork. If you like you can paint the entire board with glue first first, or paint a little bit on at a time and stick the pieces on as you go, as the girls preferred to do. Our artworks turned out so colourful and each one is unique. We were happy with all of the results and hope to repeat this activity again some day. My kids love making patterns and they love anything using small pieces so this craft was a hit at our place. Hi! Love your ideas and would like to join your fan club! It’s a pleasure to find you and be inspired with your creations. Thank you ever so much for being here. The first time I went to your website, the subscription popped up, but I wanted to check the site out before I signed up. Now I want to follow you and want to subscribe. Hopefully, filling in the info below will work.